Woking manager Garry Hill and his assistant Steve Thompson have agreed two-year extensions to their contracts with the Conference Premier club. The duo, whose previous deals were due to expire next summer, will now remain at Kingfield until the summer of 2017. "We've shaken hands on it and it is a done deal," Cards chairman Mike Smith told BBC Surrey. "The minute we get respite from the hurly-burly of Conference battle we will be putting the ink on the paper." He added: "Garry and Steve's handshake is good enough for me - they will be with this club for much longer. "It gives us that further stability and continuity that we feel we need to build this club." Hill was appointed Woking boss in January 2011 and led the Surrey club to the Conference South title in 2011-12. The part-time side finished 12th in Conference Premier last season and the Kingfield outfit could secure a top-10 finish this weekend. 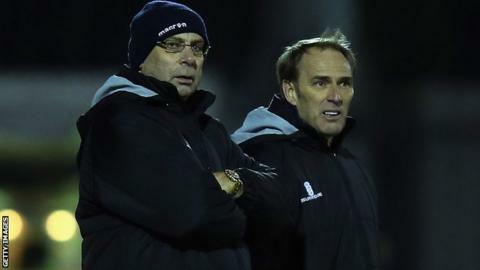 "Me and Steve work very well together and have enjoyed the period we have been at the club," Hill told BBC Surrey. "The chairman and the board of directors have always been up front with me and been open and honest all the way through. "It is a very good club and I am pleased to be offered the contract extension. We are going in the right direction."